Solid wood cream painted units. Oak island unit. Cream granite worktops. Solid wood cream painted units. 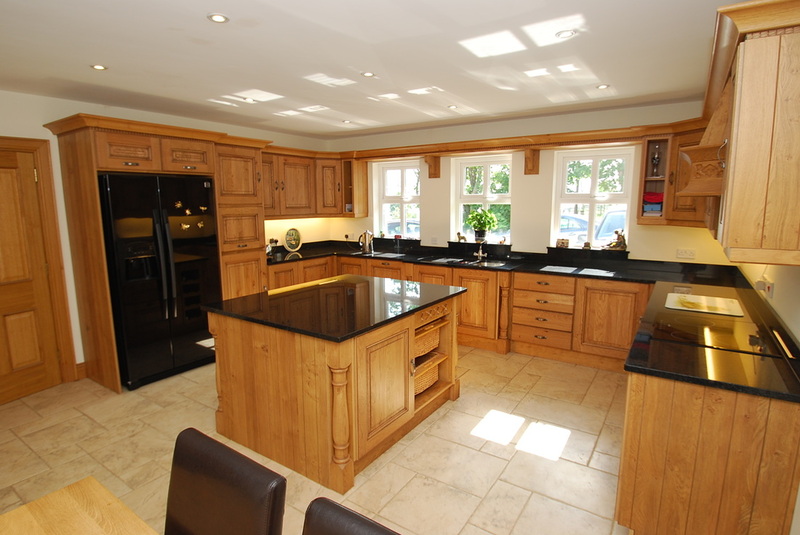 Black granite worktops. Porcelain floor tiles. Solid wood cream painted units. Oak island unit. Black granite worktops. Porcelain floor tiles. Solid Wood kitchen painted cream,island grey, Quartz worktop, Porcelain floor tiles. 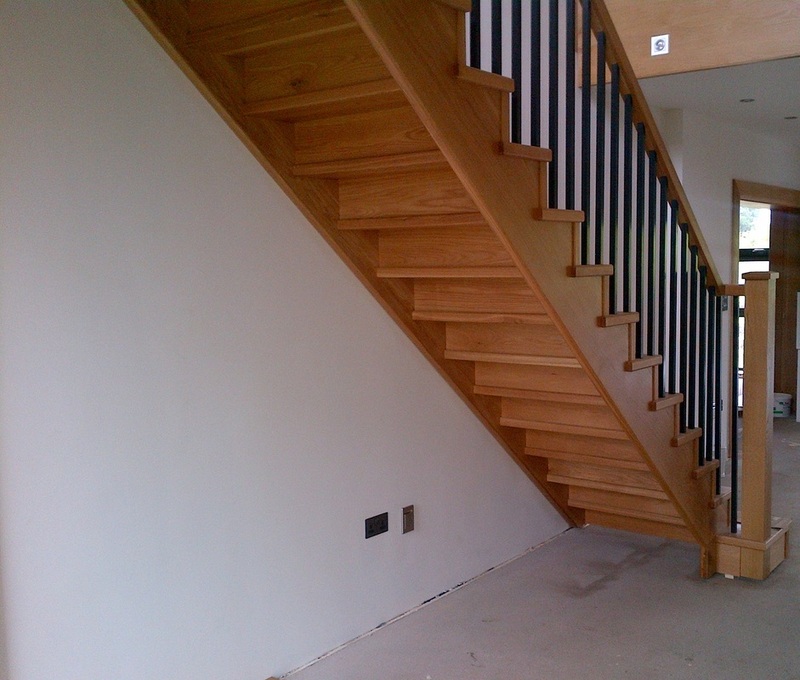 A selection of stairs supplied by Joinery specialists & fitted by our own Joiners. 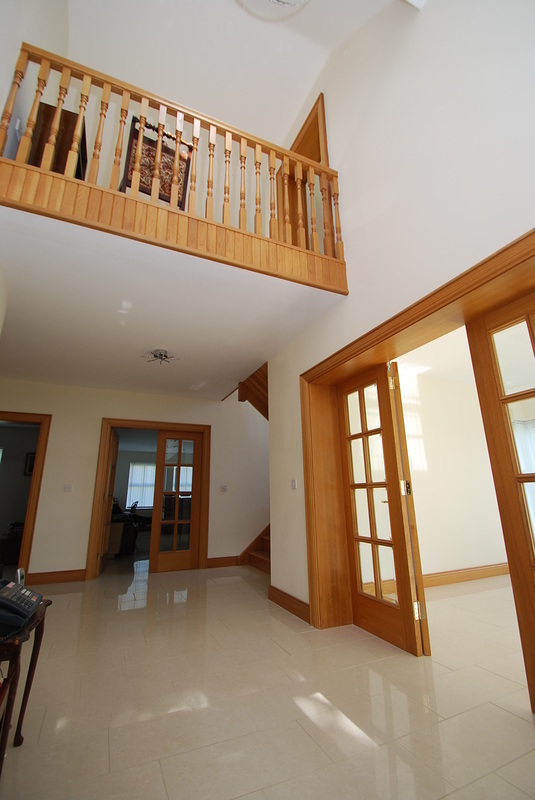 Stair 1 Oak cut string staircase with 1/2 landing. 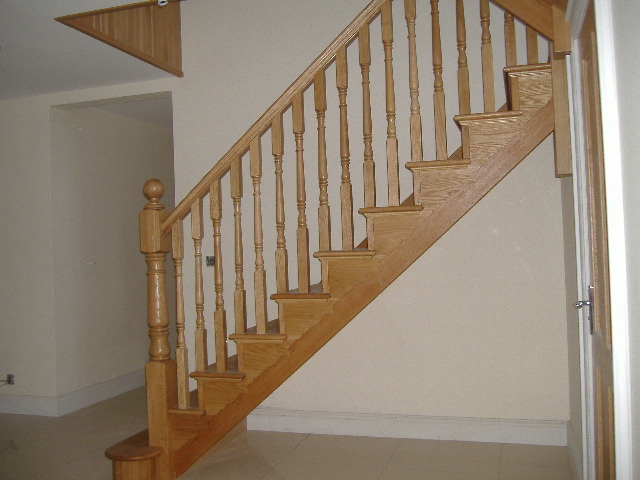 Solid Oak treads, risers, newel-posts, spindles and tongue & groove sheeting underneath. 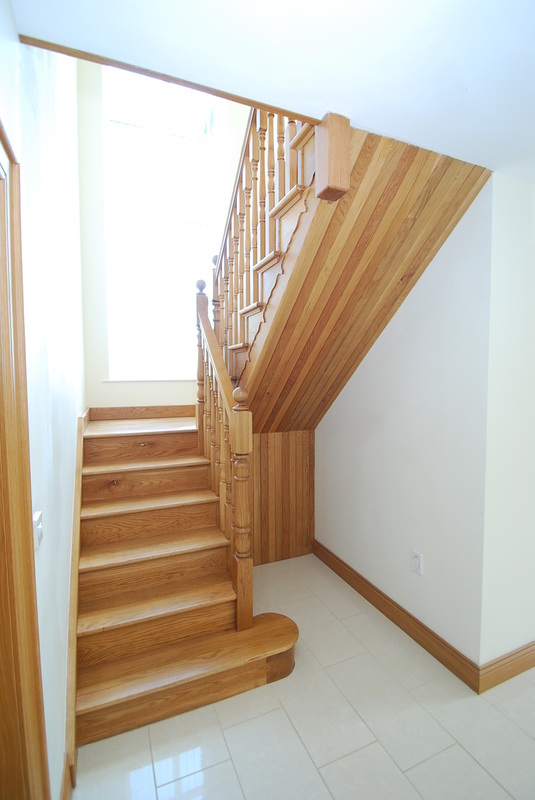 Stair 2 Oak cut string staircase with bull-nose bottom tread & 5'' newel posts. ﻿Stair 2﻿ Oak newel posts, spindles, tongue & groove sheeting around landing. 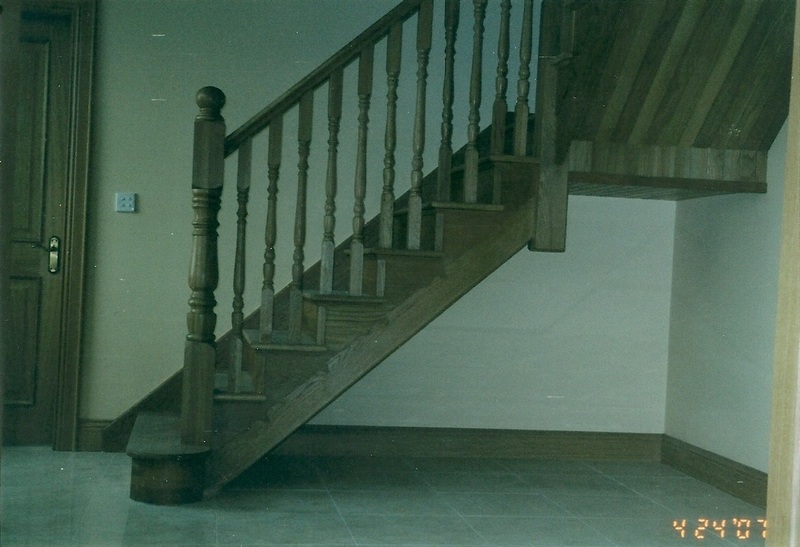 Stair 2 Oak cut string, Bull-nose bottom tread, 5'' turned newel posts & turned spindles. 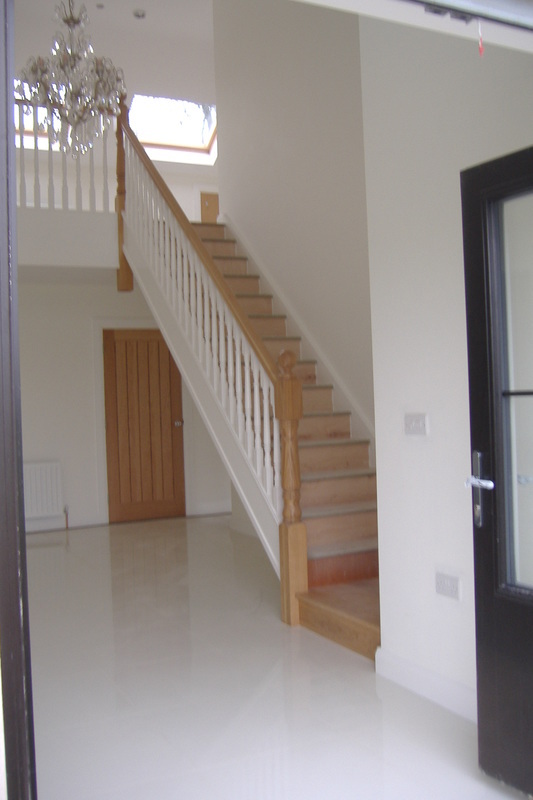 Stair 3 White painted closed string staircase with Oak 5'' newel posts, handrail & bottom tread. 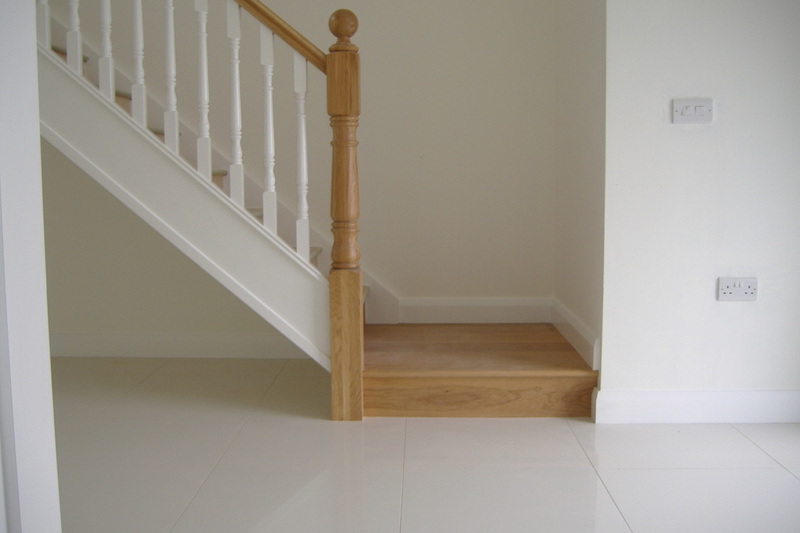 Stair 3 White painted closed string staircase with Oak 1/4 landing bottom tread. 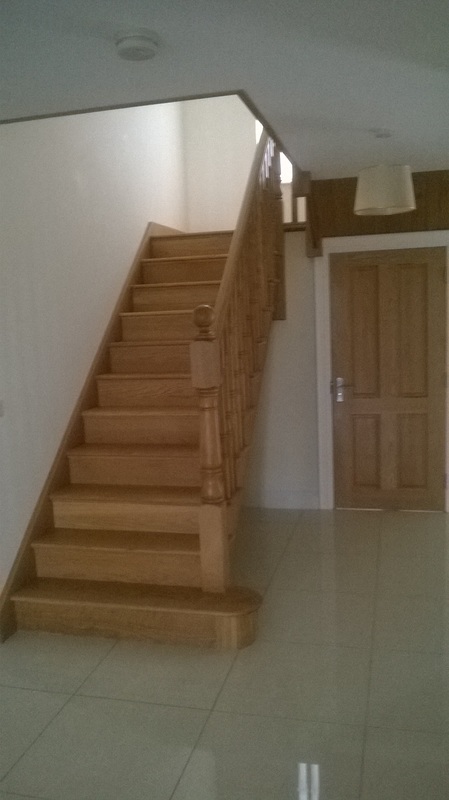 Stair 4 Oak closed string staircase with Oak 1/4 landing & 5'' newel posts. Stair 5 Oak closed string staitcase, mdf treads for carpet. 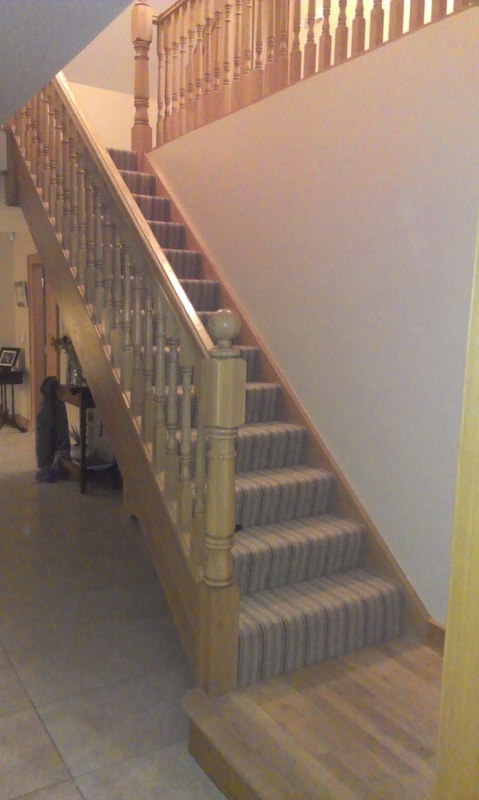 Bottom double bull-nose tread, 5'' newel posts, handrail & spindles in Oak. 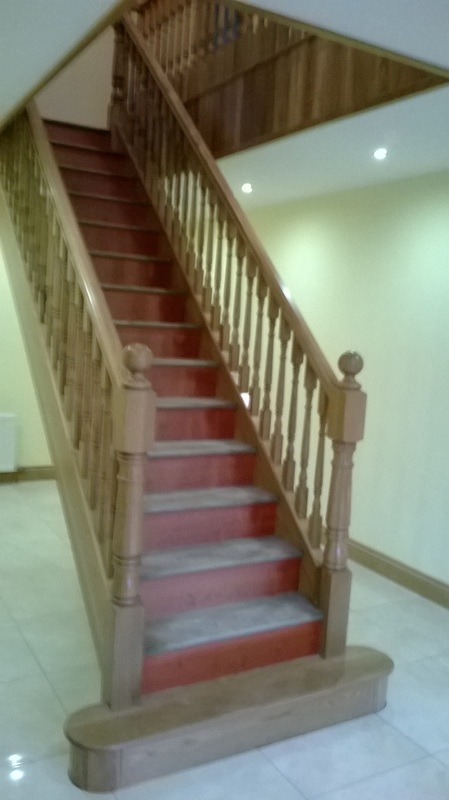 Stair 5 Centre Hallway staircase with mdf treads for carpet, Oak double bull-nose bottom tread, double 5'' newel posts, handrail & spindles. Stair 5 Centre Hallway staircase. 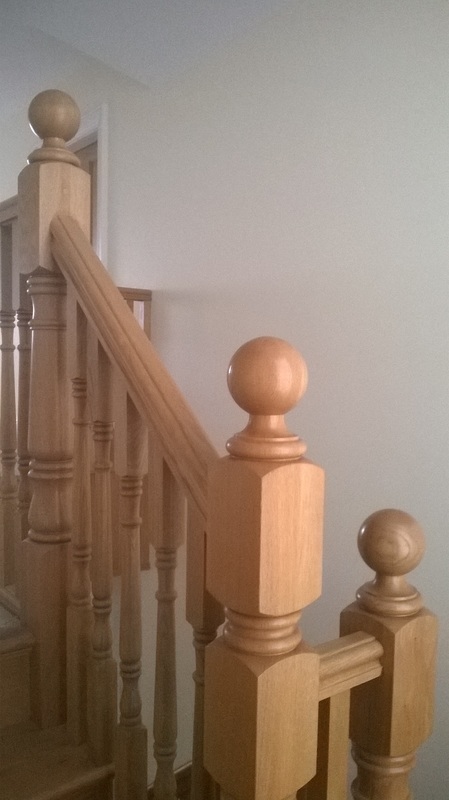 Oak turned 5'' newel posts, turned spindles, tongue & groove sheeting. 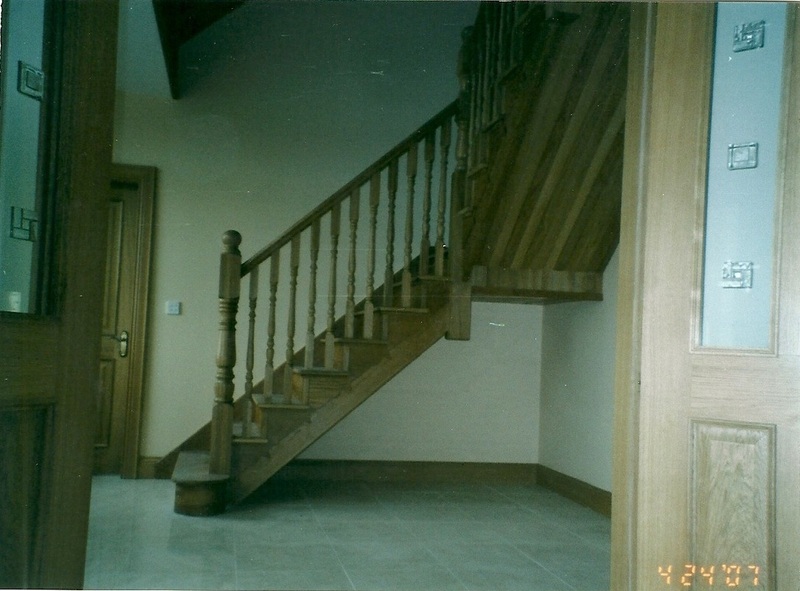 Stair 6 Oak cut string staircase with oak treads , risers, newel posts & handrail. Metal spindles painted black. Underside of staircase is left exposed. 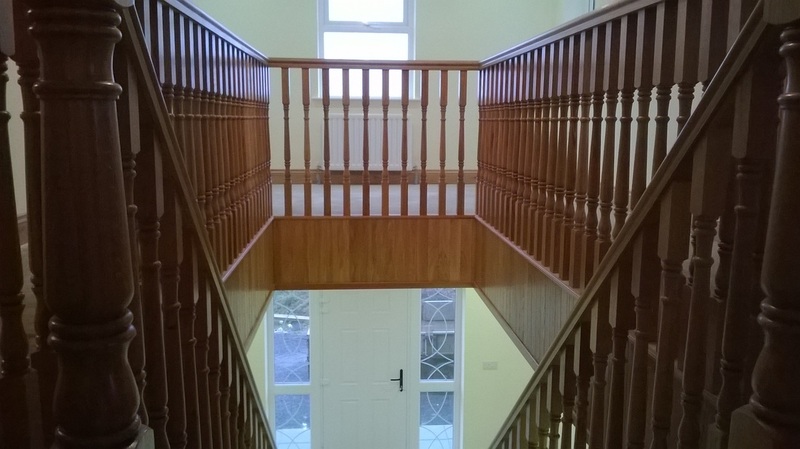 Stair 7 Oak cut string staircase with 1/4 landing. 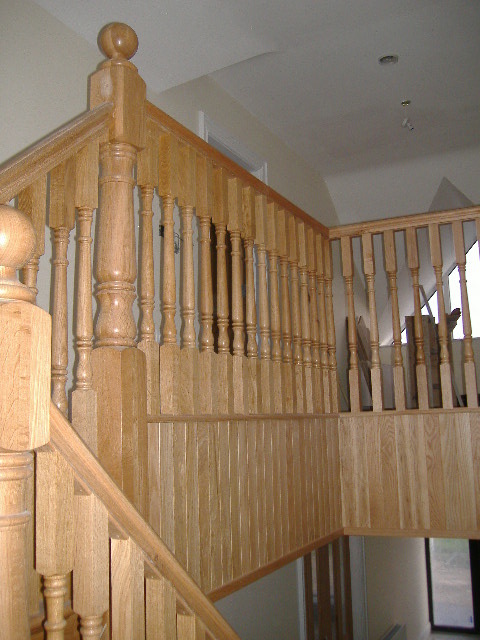 Oak turned newel posts, spindles, treads, risers, tongue & groove sheeting. This stair is free standing at 1/4 landing. 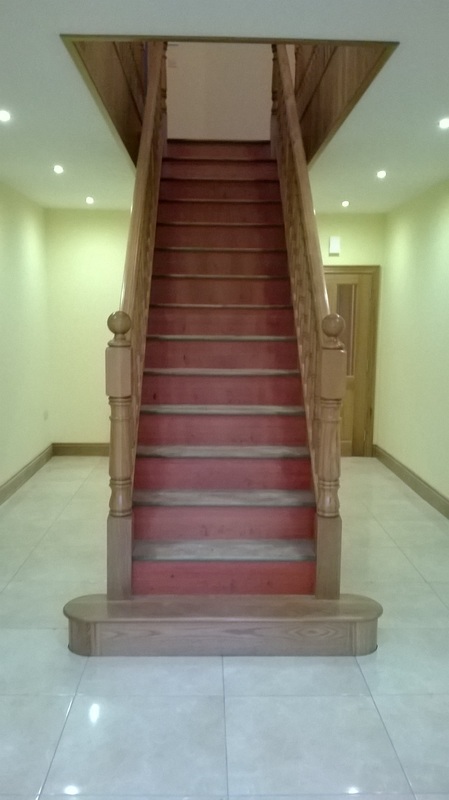 Stair 7 Oak staircase free standing at landing.